The Rudder Control Module is the most popular rudder pedal in the industry. 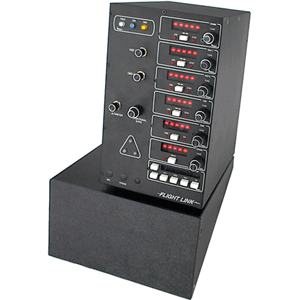 The Rudder Control Module (otherwise known as the RCM) is a must have with any serious flight simulation configuration. The RCM uses industrial grade hydraulic cylinders which simulate accurate damping effect found while in flight. The RCM offers over 6 inches of pedal deflection rather comparable rudder pedals on the market which travel 3.5 inches. The RCM also offers self-centering of the pedals. Our newest RCM design offers progressive differential toe brakes which increase the braking force on the aircraft relative to the depression of the toe brake on the RCM. The standard version of the RCM works with our AV-B flight console. You can purchase a stand-alone USB version of the RCM as a plug-and-play device. SKU: RCM. Category: AIRPLANE SIMULATION HARDWARE. Tags: Airplane, control, flight, hardware, rudder, simulator. *toe brakes do not work with G-Sticks. Be the first to review “Rudder Control Module” Click here to cancel reply. Flight Simulator Hardware | Flight Link © 2019. All Rights Reserved.